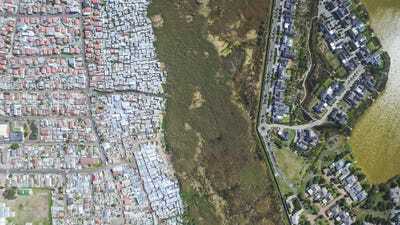 For nearly 50 years, systematic racial suppression and segregation gripped South Africa. 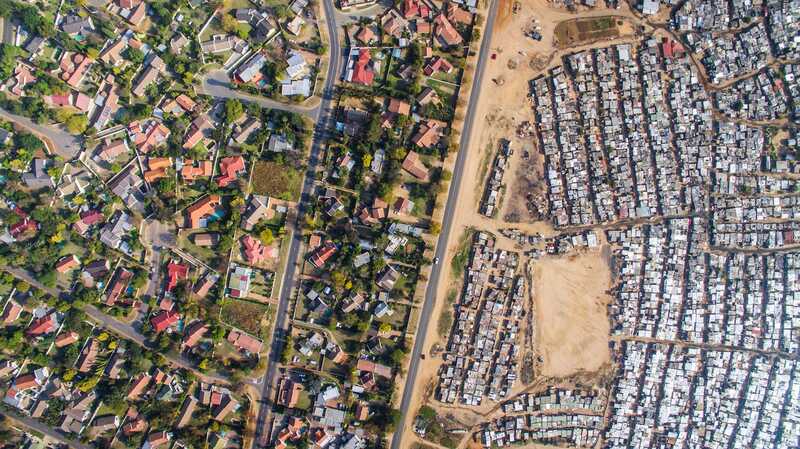 While the tides turned in the early ’90s and laws were overturned, apartheid had already seeped into the country architecture. Roads, rivers, and fields functioned as “buffer zones” to separate people by race. 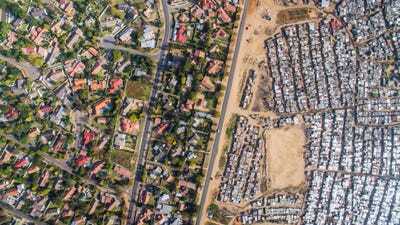 In 2016, photographer Johnny Miller set out to capture “the architecture of apartheid” from above. Separation gave the government the ability to reduce the black community’s access to education, high-quality jobs, and city resources, leading to extreme divisions of wealth. 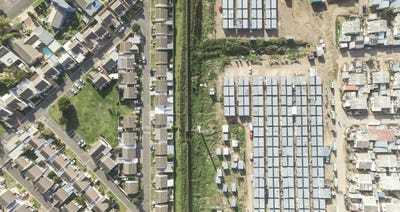 Miller’s drone pictures show the contrast as never seen before. Miller shared some of his photos with us. 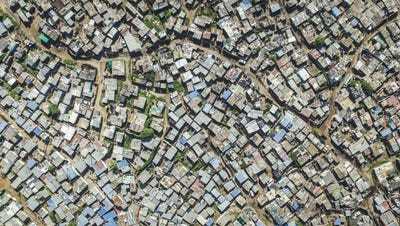 You can check out more on his project website, Unequal Scenes. Black people, sometimes referred to as 'coloured,' have been disenfranchised in the country for hundreds of years. Starting in 1948, apartheid protected racism under the law. Apartheid also brought about labels to differentiate between non-white people from different origins. Black people came from the Eastern Cape and spoke Xhosa, while mixed race people, called 'coloured,' descended from slaves from Indonesia and Madagascar or were indigenous Khoisan people. 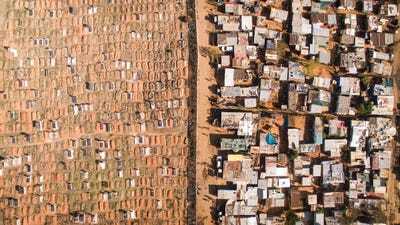 In the years following, black people were forcibly removed from their homes in rural areas and dropped into slums. The new developments were spaced apart to prevent black people from unifying under one nationalist organisation. Masiphumelele and Lake Michelle, Cape Town, South Africa. Apartheid is no longer law. 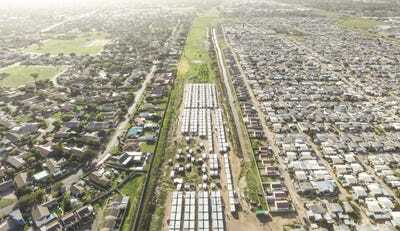 But fast-forward more than 50 years from when apartheid laws were put in place, and many black residents still live in tin shacks, confined to sandy, arid areas far outside the city. 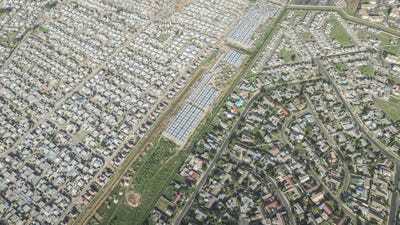 Vusimuzi and Mooifontein, Johannesburg, South Africa. 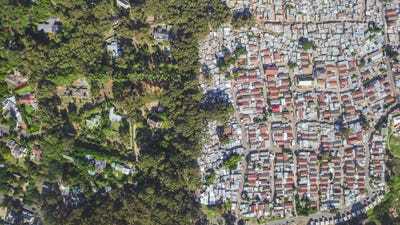 The wealthy, white people claimed leafy neighbourhoods on the Atlantic seaboard and near Table Mountain, closer to the downtown area and its resources. Hout Bay and Imizamo, Cape Town, South Africa. 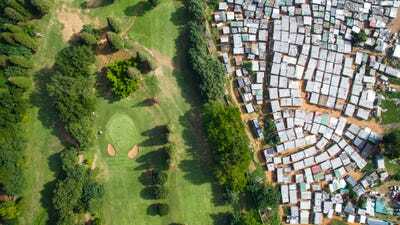 'Interestingly, sometimes you have very poor communities that, for one reason or another, exist right in the middle of very wealthy neighbourhoods,' Miller says. 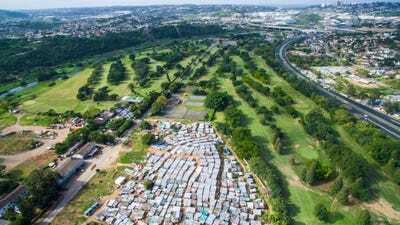 Papwa Sewgolum Golf Course, Durban, South Africa. 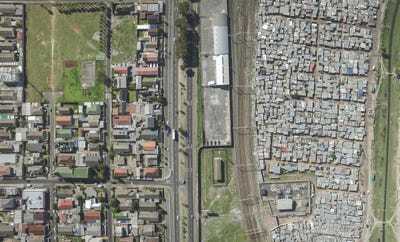 Manenberg and Phola Park, Cape Town, South Africa. 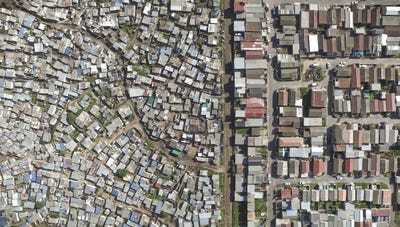 Vukuzenzele and Sweet Home, Cape Town, South Africa. See more shocking photos from Miller's series, 'Unequal Scenes,' by clicking here.